The FAQs were updated to provide clarification about the Ask Me About feature. Today’s post on Delve was written by Mark Kashman a senior product manager on the Office 365 team. A company’s most important assets are its people—YOU. The knowledge and experience of you and your colleagues collectively brings great value to your company. And as you communicate and work out loud together within Office 365, the value of your work can be surfaced and discovered by others in Delve. Sometimes you want to search and discover content based on a keyword or topic, but often you want to learn more about a specific person and what’s trending around them. Today’s enhancements to the Office 365 personal profile experience, within Delve, deliver a richer people-based search and discovery. The new Profile experience in Delve, alongside the person’s Activity, promotes their About me information, ways to Contact them, their Organization structure, Blog and more. Note: some of the features pictured above, like Working on and Praise, will ship in the near future after today’s announcement. Learn more how to view and edit your profile and how you can find people and information in Delve—both articles will be updated to correspond with all changes. You will also notice a new section in your profile, Blog. We improved things to make it easy for you to express yourself within your organization in a more modern way. When you have new information or a point of view to share, simply click start writing in the Blog section of your profile. The new tool allows you to both edit and view pages from your mobile device, auto-saving as you go. It also provides the ability to post pages directly to Yammer, automatically creating friendly, readable URLs. And because it’s integrated across Office 365, it’s easy to embed documents inline from OneDrive for Business, videos from Office 365 Video, even photos from your desktop. And finally, it’s fast, modern and ready-to-go. This internal blogging tool is the first Office 365 experience to use the authoring canvas, a completely new page authoring platform for Office 365. Today, the authoring canvas helps you create engaging blog posts, and in the future, it will be enabled for use in creating various types of pages in Office 365, including those for individual profiles, Office 365 Groups and future NextGen Portals. And the authoring canvas will be backed by enterprise-grade, content management capabilities such as scheduling, versioning, compliance and taxonomy. (Left)The new authoring canvas in desktop edit mode. The inline toolbox pop-up helps you easily add content. (Right) Viewing a page on a mobile device. We are excited to introduce Delve mobile apps for Android and iPhone, ensuring that connecting, discovering and sharing information with others is easy, even on the go. These mobile apps can notify you about updates to files you are actively engaged with at any given time. You can even receive notifications on your connected Android Wear. No matter how busy life gets, Delve has you covered, connecting you and your team with the right information and people—at the right moment—even on-the-go. (Left) Main work activity feed. (Center) Discovering and finding people. (Right) New people layout with “WORKS ON,” “WORKS WITH” and other pivots. Download the Delve for Android and Delve for iPhone app today. What’s next for people experiences? We’re extremely excited to bring these new ready-to-go people experiences to you via Delve and Office 365—and we’re just getting started. We are already hard at work planning and developing what comes next, which will roll out to the service automatically when the new features are ready. We will continue to refine the overall Office 365 profile experience, introduce a method to nurture your network via public kudos, provide ways to pull in additional profile information from trusted sources and machine learning insights, and enable customization of the profile experience via Add-ins and public APIs. If you have an idea for a future Office 365 people experience feature, please visit our Delve UserVoice page and submit your feedback using the People Experiences category tag. And vote items up! You will see us continue to iterate and build more and more of what you tell us you need. We will share and show more at Ignite (May 4-8 in Chicago). Hope to see you there. On Wednesday, April 15th, the Office 365 Network will host a People Experiences in Office 365 YamJam from 9:00–10:00 a.m. PDT / 4:00–5:00 p.m. GMT. For those unfamiliar with a YamJam, it is similar to a “TweetJam” on Twitter or an “Ask Me Anything (AMA)” on Reddit, except it takes place on Yammer. In this YamJam, customers and partners can connect directly with the Delve and Profile product teams to ask questions and learn more about the announcement. Join the Delve group to participate. Q. Will the Delve apps for Android and iOS be available in all markets? A. Starting today, the Delve app for Android and iPhone will be available in the U.S., Ireland and Norway markets and will expand to all supported markets in the following weeks. Q. Which versions of iOS and Android do the Delve mobile app support? A. Delve mobile will run on iOS 8.0+ and Android 4.4 and above. Q. 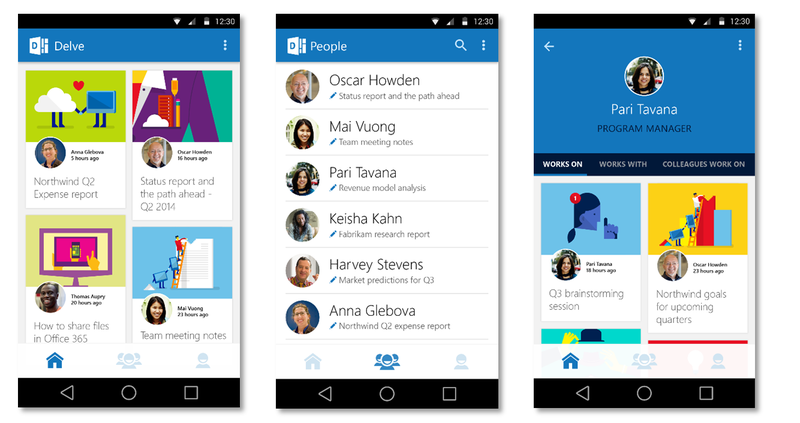 Do the Delve mobile apps offer all of the same functionality available in the web experience? A. We’ll be iterating monthly to integrate not only the existing Delve web scenarios (such as Boards, improved profile, etc.) 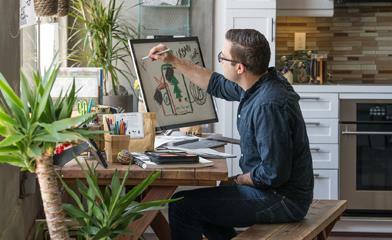 but will also look to introduce user-focused features to help you get even more done while on the go. Stay tuned for more updates. Q. Where can I learn more about Delve mobile apps? A. Please see this page for more information. Q. What if my company had customized the previous About Me experience? A. The new user profile page does not yet support customization. To help with your transition to the new experience, we will keep your custom My Site experience accessible to your users for the next six months. 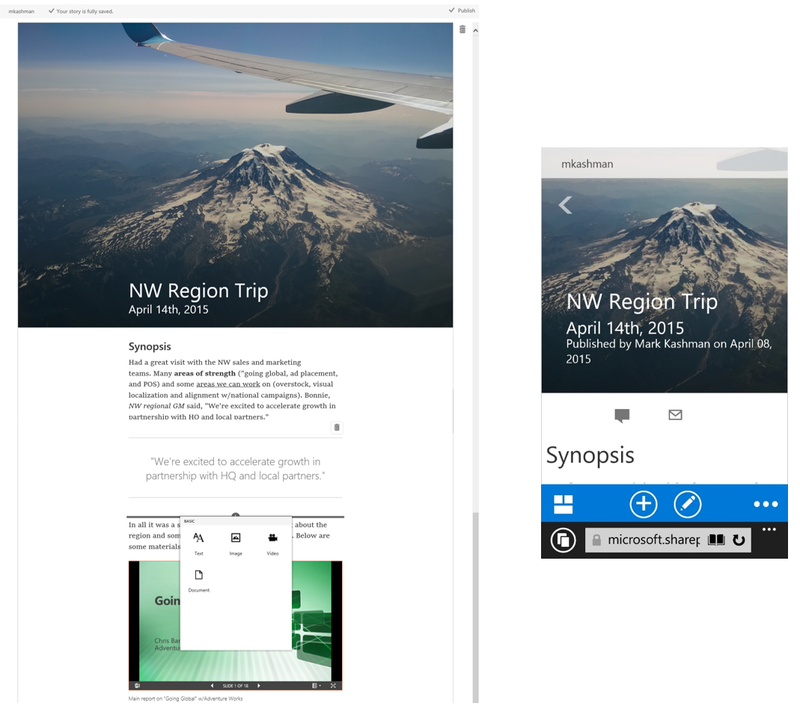 We are working on features to help you extend the new experience with custom capabilities. Q. 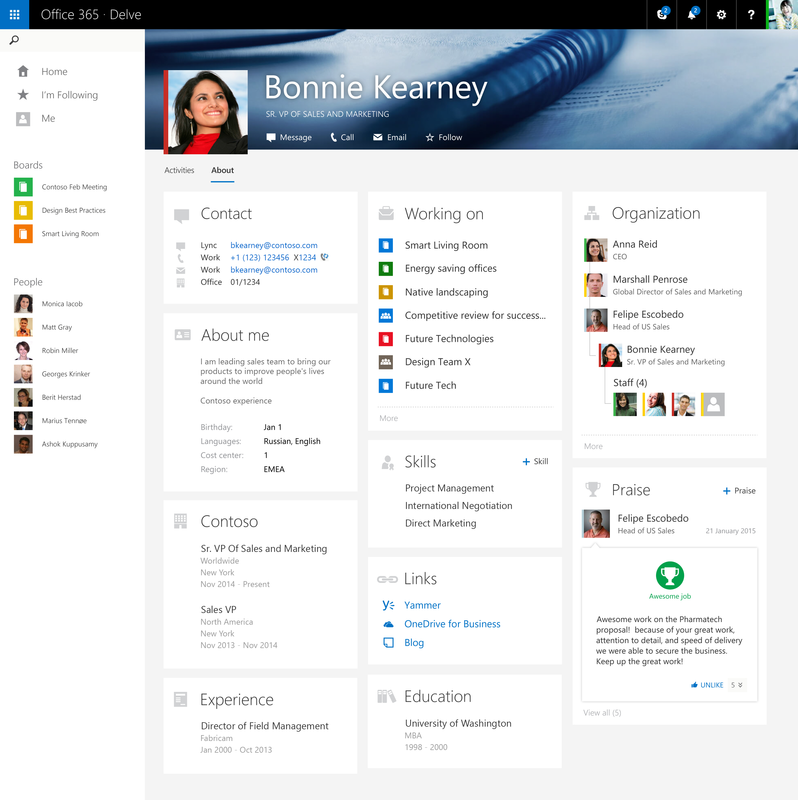 Are the profile updates rolling out to all Office 365 commercial customers? A. Yes, profile updates will roll out to all Office 365 commercial customers. Customers with Exchange Online only plans will only see the core Office 365 profile page layout, which also received updates in terms of responsiveness across devices. Please note, if you opted out of Delve, the profile is located under Sites, not Delve. Q. When will the profile changes come to my Office 365 production tenant? A. The new profile experience began rolling out to Office 365 First Release customers today, and is expected to roll out broadly in the coming months. Q. Will my blog posts, created within SharePoint Online My Sites? Will they continue to exist once the new Blog platform rolls out? A. Previous blog posts created within SharePoint Online My Sites will become accessible from the new Blog home page in your personal profile. Once it ships, the new Blog home page and authoring canvas platform will replace the My Site blog technology, and all new blog posts will be created using authoring canvas. Q. What happened to the “Ask Me About” section within the profile page? A. This was removed by design. Microsoft is working on a new machine learning-driven component to help showcase ideas and projects users are actively working on.